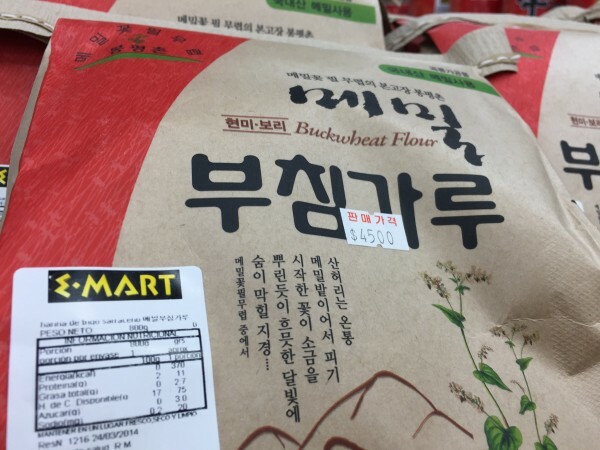 The elusive buckwheat flour, found at E-Mart. In addition to the where do I buy hazelnuts/brown sugar/dried ginger questions of yore, many of which I have answered here, in this post about tostadurias, is the ongoing question of where to buy Asian food products. Maybe you’re looking for rice noodles, because you are celiac, or a gallon of hoisin sauce, because you are catering a wedding (do not try to make 200 spring rolls on your own, really, you will regret it, I promise), or other Chinese/Taiwanese/Korean/Asian ingredients, just because they’re your comfort food, or you’re trying out a new recipe. There are other stores that sell some of these products, like the series of “health food stores” I’ll talk about someday but seldom shop at. Some items are often found as well at gringofied supermarkets, like anything above Tobalaba, particularly Jumbo. But below are my five tried-and-true east Asian markets for whatever soothes you, and a bonus for a few Indian products. Which is also Asia, but if you’re from the United States, we usually hold it out into another category. Seems to be one of the first importers to break out of Patronato. There are locations on Merced (in Bellas Artes) as well as up in Providencia. I go to the one on Merced, and find it a good source of tofu (but go early, they run out), coconut milk (though you can also get some brands at Quesos Arturito in and around the Vega), and usually, tapioca flour, which I used to make Brazilian tapioca (like a crepe), as well as shoyu. They had powdered coconut milk there not long ago, which is great for camping, and also matcha powder which I love. This is the smaller of two stores I often go to in Patronato, in Recoleta, on Antonia Lopez de Bello. It’s a little more cramped, but they seem to have different suppliers of items like the aforementioned tapioca flour, and sometimes have better prices than the next one I’m going to recommend, but it’s right across the street. They also have kimchi and seaweed salads, and frozen edamame (angels sing!). This is the biggest of the Asian markets, but most of what they sell is packaged, and they have a huge canned coffee and other drinks from Asia section (with gummies, etc). This is usually my first stop in Patronato. On warm days they have bubble tea, with all the flavors, like taro, sesame, etc. They also usually have dried lemon grass and galangal. The sushi is not so different from convenience store sushi, but will fill you up in a pinch, though there should not be a pinch, because you could go to Chicken Story or Había una Vez, two handy snacky places nearby, both Korean. The first sells fried chicken and the second mostly baked goods. I have not tried the chicken place, but I hear it’s crunchy. This Korean-owned store is a tiny bit off the beaten path, on Eusebio Lillo (Patronato, Recoleta), inside an open-air shopping arcade that mostly sells clothes. They have lots of fresh and pickled items, and tofu in a refrigerated section, and sell some harder-to-find items like flavored nori snack packs, soba noodles in big packs, buckwheat flour, Korean sodas, and some Korean housewares/containers. It’s brightly lit and has wide aisles, especially in comparison to some of the other shops in this neighborhood. It was also the first place you could find Starbucks double shot canned sweetened milky espresso, that packable elixir, though now you can find it other places (like China House Market), and also, there is bottled cold brew to be had now in Santiago, more on that later. This Taiwanese-owned market has fresh “Chinese vegetables,” (sorry, I cannot identify these other than bok choi and what I grew up calling “chinese broccoli” with long stems and florets and only a little bit bitter), three times a week, but come early, as they are easily sold out. I think it was M-W-F. They also have Szechuan peppercorns, lots of canned and jarred items, and some frozen as well, and fresh tofu. I bought my nut milk bags here for making almond milk. This shop is probably a bit farther afield for most English-speakers living in Santiago, and is in Estación Central, so many people may not find themselves close by, but it’s worth a visit. Not that much Spanish spoken. For all things Indian. This is the only place thus far in Santiago to buy the following things: Pickles (as in lime pickle, lemon pickle, etc), dosa and idli mix, and those salty crunchy spicy snack mixes, ghee and packaged curries and chutneys. They also sell dessert mixes, some hard to find spices, and have good prices on Basmati rice. They speak Spanish and English. It’s a small shop, and it is not infrequent that they are waiting for a shipment of something, so best to pick up essentials there before planning the rest of your meal, in case they are out. Location; Manuel Montt 092 and 094. This is a good time to point out that when an address starts with a 0 in Chile, it means it is on the “other side” of something. In this case, it means it’s to the north side of Providencia, between that and the river. If you look for it on the side where the addresses are not preceded by 0s, you will never find it, though you will pass a bubble tea shop I do not care for (Metro Manuel Montt). There are many other smaller east Asian markets in various places, mostly only selling noodles, tea and snack food, as far as I can tell, as well as near Unión Latinoamericana metro on the Alameda. The latter are quite large, and deserve exploring. Many sell crockery and dishes from China, so if that’s your style, or you need chopstick rests, etc, that’s where I’d head. I do not recommend buying packaged moon pies from these, as I had one very unpleasant experience doing such, but maybe that was a one-off. If you’d like to recommend a specific place that you’ve personally shopped, I’d love to hear it. These posts are some of the most searched for and linked to and otherwise fan-fared pieces on the blog, particularly for expats. Let me know if you’re dying for different genres of shop roundups, too. I’m all ears. And mouth. Nice list. Thanks for publishing this. It’ll help the next time I’m staying in Santiago. I love this. And you always have a much, much wider range than we do. It struck me also, that you don’t go to the “chino” for Chinese or any other kind of Asian food. There’s one store that I know of that sells a range of noodles, sauces, and pastes. Otherwise, maybe sometimes you’ll find soy sauce randomly at a market. And you cannot buy Argentina soy sauce, bc it’s really just brown salty water. Buenos Aires has a much better selection. Why don’t you care for the bubble tea shop?